This chapter shall be called the “Columbus Bassmasters” of Columbus, Ohio. The purpose of this chapter is to stimulate public awareness of bass fishing as a major sport and to offer our state conservation department: organized moral and political support, encouragement to promote full adherence to all conservation codes, and to demand adequate water standards. In addition, the chapter will seek to detect, report, and call public and political attention to any polluter’s crime. As a goal, the chapter will try to improve its members’ skills as bass anglers through a fellowship of friendly exchange of expert bass catching techniques and ideas, and to promote and encourage youth fishing and a love for this great recreation. In addition, this chapter will seek to function as a dynamic and effective link with other chapters of the Ohio Bass Federation (OBF) / OBN while embracing the principles and purposes of The Bass Federation, Inc. (TBF) / BASS. A. The chapter’s membership shall not exceed a total of 36 active members. This membership may be altered by amendment. A. Voluntarily express a genuine interest in membership. B. If prospective member wants to join the club and be affiliated with FLW, the club dues will cover FLW affiliation. If prospective member wants to affiliate with BASS, he / she must join BASS on his / her own before he can be added to the official BASS club roster. C. It should be considered by the chapter membership that a balanced ratio of boaters and non-boat owners would be achieved by acceptance of the proposed member. D. If a non-boat owner is proposed for membership and elected as set forth in Article II, section 2, and his/her membership puts the boater/non-boater ratio out of balance, then this member must accept that he/she would be the first member out of any chapter fishing event until balance is regained. E. A chapter member must be at least 16 years of age and have a waiver from parent. A. Club Dues are $10/month, but if annual dues are paid in full at the October meeting, a discounted rate of $110 / year will apply. c. All affiliation dues will be due at the October meeting in order to meet deadlines for FLW / BASS. B. Upon acceptance in the local chapter, all monies are non-refundable. C. Members who are delinquent more than 60 days in dues will not be eligible for any chapter tournament, awards, or voting rights until such time as the member’s dues are current. Delinquent members shall be subject to removal from the chapter if the dues are in arrears by 60 days or more (see Article V- removal from membership). a. Presides over all meetings and direct all official business. Appoint and be ex-officio member of all committees, supervise all chapter functions and represent the chapter at the state level. He/She will also appoint conservation and youth directors. a. Act as a program chairperson, assist the president in his/her duties and preside in the absence of the president. He/she will call to order and maintain order during regular meetings and functions. b. Aides the Tournament Director in his / her duties. a. Maintain accurate financial records and present current balance and expenditures at each regular meeting. He/she will collect dues at each regular meeting and present a list of all members delinquent in arrears of 60 days or more. a. Maintain accurate minutes of all regular and special meetings as called by the chapter president. Maintain regular liaison between the chapters, TBF and the OBF. He/she will also assist in all secretarial needs of all officers and committees. Past minutes of monthly meetings should be typed and available for review. a. The purpose of the tournament director shall be to plan, organize, keep records of, and operate all chapter tournaments. He/she will draft and enforce all tournament rules and investigate all protest(s) concerning tournaments and make recommendations to the board of directors. b. The Tournament Director will have sole discretion / authority to cancel or postpone any tournament that he or she deems unsafe to fish. A. Elections of Club Officers will align with the election cadence of the OBF Region 1 Directors and will be staggered to ensure coverage of Club Business through the election process and ease the transition of new officers. a. Elections of the President, Treasurer and Tournament Director will be held during even years. b. Elections of the Vice President and the Secretary will be held during odd years. B. Nominations for officers being elected during that calendar year will be taken during the February and March meetings with no nominations being taken thereafter. C. The election of officers shall be held annually at the regular membership meeting during the month of June. Election shall be by a simple majority of the members present. Election for each officer shall be held separately in order listed by article III, section 1. A. Each member current in dues is entitled to one vote. Proxy votes are not permitted. Only members present at the meeting will vote for offices. A. The term of office is for two years, which shall begin on July 1, and end on the last meeting day of July or until the successor assumes office. B. In case of a presidential vacancy, the vice-president will assume the presidential position and a new vice-president will be nominated. A. Must have been a member for at least 6 months. B. Must have attended at least three-fourths of the chapter meeting and three-fourths of chapter functions. C. Must have shown an active interest in all chapter functions. A. All standing committees will serve for two years or until a new committee is appointed. The terms of the committee members will coincide with that of the president. A. The board of directors will consist of five members: the President, vice-president, secretary, treasurer, tournament director and the immediate past president. a. The president will call all meetings of the board of directors and will preside at such meetings. b. The secretary will record the minutes of these meetings. c. The board will decide all protest and will rule on all violations of the tournament rules and by-laws of the chapter when appropriately received. A. The purpose of the youth committee shall be to plan, organize, and implement a chapter youth project which will: introduce young people to the goals of TBF, give them a basis for respect of our national heritage, give them appreciation of the basic rules of honesty, integrity, fair play, good sportsmanship, and give them an introduction to the sheer joy of fishing. A. The purpose of the conservation committee shall be to protect our natural environment from harmful change. The conservation committee will also document and report to the proper authorities, violations of local, state, and federal anti-pollution laws, statutes, regulations, ordinances, and other regulatory devices. The committee will take political action to protect our environment, and take a leadership role in repairing the harm that has already been done to the life giving waters of America. The committee shall also organize and institute the environmental projects of the chapter. a. Failure to pay dues. b. Any individual action/behavior, which would reflect dishonor and/or disgrace to the Columbus Bassmasters. c. Lack of participation in chapter committees. B. Removal shall be accomplished by a secret ballot at a regular monthly meeting and shall require a two-thirds vote of members present. C. Any member removed from the chapter will be notified by mail unless present at the regular meeting. Appeals may be made to the board of directors for review. A. Any active club member that cannot continue participation in the clubs functions because of work, relocation, or personal reasons, must submit a request to the club requesting to be put on inactive status. The club will vote on the request. There are no dues involved during inactive status; however, the member must be current in his/her dues when inactive status is requested. B. Any inactive member that wants to be reactivated must attend a regular monthly meeting and express his/her desire to be reactivated. The club will vote on this request. C. If a member is reactivated, he/she must pay dues to maintain active status. The member must also pay his or her own OBF and TBF dues. Once reactivated, the member will be placed on the bottom of the seniority list. After the current season has ended, the inactive member will be reinstated with seniority. D. Inactive status will be granted for the remainder of the season and (1) additional season. A. All tournament competitors must observe safe boating conduct at all times. B. Each tournament competitor is required to have a coast guard approved chest-type life preserver on during a tournament when the combustion engine is in operation. C. No competitor will ride in an elevated fishing chair while the combustion engine is running and the boat is in motion. A. Competitors in Columbus Bassmasters’ tournaments are expected to follow high standards of sportsmanship, courtesy, safety, and conservation. Any infraction of these fundamental sporting principles may be deemed sufficient cause for tournament disqualification. B. Maximum courtesy must be practiced at all times especially with regard to boating and angling in the vicinity of non-competitors who may be on the tournament waters. C. No alcoholic beverages, stimulants, and/or depressants are allowed in the boats or at the weigh-in during the tournaments. D. A fifty-yard rule between boats is in effect during all Columbus Bassmasters’ tournaments. This rule only applies to anchored boats with the trolling motor removed from the water. A. Only artificial lures may be used during tournaments. No “live bait” or “prepared bait” will be permitted with the exception of pork rind. B. All bass must be caught live and in a conventional manner. C. Trolling / strolling as a method of fishing is also prohibited. D. Only one rod may be in use at one time. A. All Participants will be paired for the tournaments by random draw, which will occur at the meeting prior to the tournament. B. Standard non-boater fee will be $20.00 per day per tournament to be paid to the boater. Other incurred fees such as launching and parking will be split evenly between the boater and non-boater. Excessive boat travel should be negotiated between the boater and non-boater. boat during the operation by the non-boater. A. If the chapter member does not notify someone or show up at the meeting to let the club know of your intentions to fish that event as a boater you will fish the next tournament as a non-boater on a “space available” basis. You will also lose your seniority and will not be able to jump ahead of another non-boater that had been previously drawn. 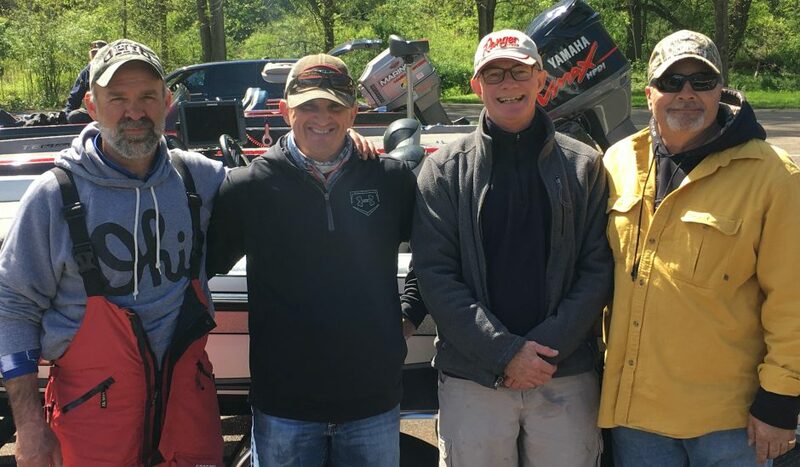 If more than one of these members show up to fish as space available and there is only one non-boater position, they will be drawn for that position. B. All members shall be current with club dues as stated in Article 2, Section 3D to acquire weight points and club awards. C. Starting positions will be based on a draw type format. Numbers for starting position will be drawn at the launch site the morning of each tournament. Highest number drawn will call out the numbers and will leave last. D. If a non-boater draws the same boater from the previous tournament, the non-boater must redraw for another partner, unless it is the last draw. Winner will receive 100 points, and each place thereafter will receive 2 fewer points. See example below. An angler who fishes, but does not weigh a fish, will receive 25 points. A. Only black bass will be weighed (Largemouth, Smallmouth, and Kentucky Bass). B. The limit will be five fish per tournament unless specified otherwise. C. Only bass which measure 12 inches or more in length (or whatever the specific slot limit is for that body of water) on the longest straight line with mouth closed shall be presented for weigh-in. Bass presented for weight-in which fail to measure the appropriate length (-1/8 inch) shall accrue penalties at the rate of one pound for each bass. This penalty will be deducted from the total score of the competitor for that event. D. Any bass that appears to have been mangled, mashed, mauled or otherwise altered will be credited only at the discretion of the tournament director. E. All fish will be measured and weighed by the elected tournament director. No competitor shall interfere with this process. F. 8 tournaments will be scheduled each year. Members’ two lowest tournament point totals will not be counted for the end of year points total. H. An angler bringing more than the specified limit of fish to weigh-in will have that’ days catch disqualified. A. Each dead fish will have a penalty of 8oz. per fish (live fish must be released unharmed). B. All anglers that do not weigh fish will get 25 points for fishing the tournament. C. Club members will get bonus for participating in special events: (Designated Youth Events, Environmental Project). Members will receive 20 points per event they attend. Any member who attends all special events will get an additional 20 points. D. The President will determine the level of participation required to receive points for the club fund raiser prior to the event. Notification of the level of participation will occur during the club meeting prior to the event. E. Club members not able to participate in special events (Club Open Tournaments, Kid’s Day, Environmental Day, Club Fundraisers and any hosted tournament) will be allowed to volunteer their help with Regional Tournaments, State Qualifier Tournaments and / or The Ohio Bass Classic and be credited with the 20 points for the event that they missed. Participation in these events must be coordinated with the chapter in advance of the event. Members making up points for ALL club functions missed will be eligible for the bonus points outlined in “C” above. F. Any member catching a bass 5+ lbs. is allowed to keep this trophy bass with an 8 oz. penalty. A. Each competitor shall check in with the tournament director no later than 20 minutes prior to the starting time. Competitors will receive official time, weigh-in time, off limits, and a starting number shall be drawn for starting position. B. If a member drawn to fish in a chapter tournament does not show up on the morning of that tournament, he/she is to receive the following penalties for 1 year from the first offense: (Special circumstances to be reviewed by the board of directors). a. 1st offense: $20.00 fine. b. 2nd offense: $20.00 fine and disqualification from the next tournament. c. 3rd offense: Review by the board of directors for possible removal from membership. d. Boater penalty money goes to the club, non-boater penalty money goes to the boater he was drawn to fish with. e. If the member notifies the tournament director of the president 48 hours prior to the tournament, the above penalties will not apply. b. 2nd Occurrence: Loss of 25 points. c. 3rd Occurrence: The board of directors will review disqualification and the matter. D. Competitors who are not at the “official check-in point” at the appointed time shall be penalized at the rate of .5lb per minute from the total weight of their catches that day including any weight to be counted towards a “Big Bass Award”. E. Any competitor more than fifteen minutes late at the close of the tournament will lose all credit for the day’s catch. There shall be no excuse for tardiness and in no case will a competitor be allowed to make up lost time. (Special circumstances – assisting a fellow club member or other person in distress). A. The tournament director will provide current point standing reports at each monthly club meeting. A. To assist the club members that advance to Regional, State Qualifier, and the Ohio Bass Classic, the tournament director will schedule a tournament on that body of water if the club deems necessary. B. To advance to the regional tournament, club members must participate in two-thirds of the club functions (Open Tournament, Kid’s Day, Environmental Day, Club Fundraisers, and hosted tournaments) and two-thirds of the meetings. C. Junior members do not qualify for regional advancement. A. All points will be accumulated and respective awards will be presented for (“Mr. Bass”, Big Bass, 1st through 4th place tags for each tournament) at the annual chapter awards banquet. B. Advancing regional team(s) will be determined by offering the available positions to the club members with the highest points earned during the qualifying season and working in descending order until all positions are filled. For example, if the club is authorized to send five 2-man teams to the regional, the top ten points winners in the club will be given the opportunity to fill those ten slots. If any decline, the opportunity will be extended to the next club member in descending order until all slots are filled. The top five point winners that accept the slots will be given the opportunity to fill the “boater” slots of each two-man team. In the case where any of these choose not to accept the boater position, it will be offered to the next in descending order. There must always be an even number of boaters and non-boaters to fulfill a two-man team. C. The positions as determined on the tournament entry forms going into and during the regional must remain the same through future advancement. D. Members who qualify for the Regional Tournament, State Qualifier Tournament, and the Ohio Bass Classic are responsible for paying all entry fees to the Columbus Bassmasters by the deadlines published by OBF (or as set by the club to ensure entries are submitted on time). After the member has attended the event, the Columbus Bassmasters will reimburse the member for the entry fees. If the member does not attend the event, he or she will not be eligible for reimbursement. a. Club dues paid for the following calendar year. b. OBF dues paid for the following calendar year. c. TBF dues paid for the following year. A. The constitution and by-laws of the Columbus Bassmasters may be amended at any regular meeting by a two-thirds vote of the members present provided that written notice of the proposed amendment has been presented to the membership at least one regular meeting prior to the vote. B. The February meeting will be when the by-laws will be reviewed and amended as needed.